The failure of the Integrase Strand Transfer Inhibitors (INSTIs) due to the mutations occurring at the catalytic site of HIV integrase (IN) has led to the design of allosteric integrase inhibitors (ALLINIs). Lens epithelium derived growth factor (LEDGF/p75) is the host cellular cofactor which helps chaining IN to the chromatin. The protein-protein interactions (PPIs) were observed at the allosteric site (LEDGF/p75 binding domain) between LEDGF/p75 of the host cell and IN of virus. In recent years, many small molecules such as CX04328, CHIBA-3053 and CHI-104 have been reported as LEDGF/p75-IN interaction inhibitors (LEDGINs). 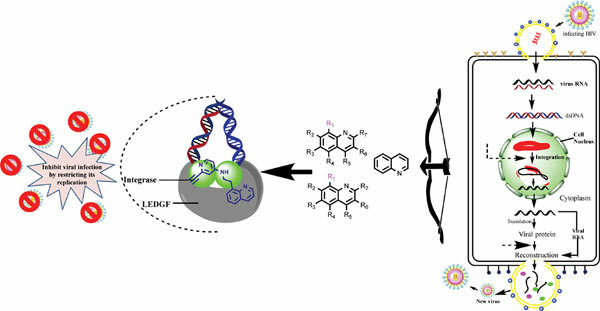 LEDGINs have emerged as promising therapeutics to halt the PPIs by binding at the interface of both the proteins. In the present work, we correlated the docking scores for the reported LEDGINs containing quinoline scaffold with the in vitro biological data. The hierarchal clustering method was used to divide the compounds into test and training set. The robustness of the generated model was validated by q2 and r2 for the predicted set of compounds. The generated model between the docking score and biological data was assessed to predict the activity of the hits (quinoline scaffold) obtained from virtual screening of LEDGINs providing their structureactivity relationships to aim for the generation of potent agents. Keywords: HIV/AIDS, Integrase, LEDGF/p75, Allosteric, Quinoline, INSTIs. Keywords:HIV/AIDS, Integrase, LEDGF/p75, Allosteric, Quinoline, INSTIs. Abstract:The failure of the Integrase Strand Transfer Inhibitors (INSTIs) due to the mutations occurring at the catalytic site of HIV integrase (IN) has led to the design of allosteric integrase inhibitors (ALLINIs). Lens epithelium derived growth factor (LEDGF/p75) is the host cellular cofactor which helps chaining IN to the chromatin. The protein-protein interactions (PPIs) were observed at the allosteric site (LEDGF/p75 binding domain) between LEDGF/p75 of the host cell and IN of virus. In recent years, many small molecules such as CX04328, CHIBA-3053 and CHI-104 have been reported as LEDGF/p75-IN interaction inhibitors (LEDGINs). LEDGINs have emerged as promising therapeutics to halt the PPIs by binding at the interface of both the proteins. In the present work, we correlated the docking scores for the reported LEDGINs containing quinoline scaffold with the in vitro biological data. The hierarchal clustering method was used to divide the compounds into test and training set. The robustness of the generated model was validated by q2 and r2 for the predicted set of compounds. The generated model between the docking score and biological data was assessed to predict the activity of the hits (quinoline scaffold) obtained from virtual screening of LEDGINs providing their structureactivity relationships to aim for the generation of potent agents.